Camping season is underway. That is, development camps for NHL clubs and many Terriers have their bags packed, ready to go. Rising junior defensemen Eric Gryba (Senators) and Brian Strait (Penguins) have already completed camp sessions. We found some encouraging comments about Gryba’s physical play on various blogs, although one questioned his willingness to hang onto the puck very long. 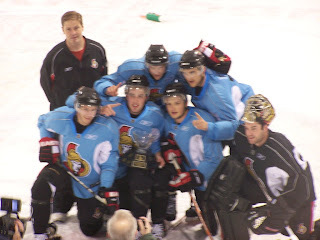 Gryba’s “team” at Senators camp won the 3-on-3 championship the final day. That’s Eric holding the trophy. Colin Wilson, a focus of much media attention and wondering among BU about whether he’ll return, also completed Nashville's development camp where he lived up to his “top ten” selection. Predators coach Barry Trotz , not yet making a decision on Wilson’s future, explained his preference for not rushing prospects. Among the other players with camping plans: Kevin Shattenkirk and Colby Cohen, Avs, later this month; Corey Trivino, Islanders, July14-20; Andrew Glass, Caps, July 7-12; Vinny Saponari, Thrashers, July 8-14; and Grant Rolleheiser, Maple Leafs, July 9-14. We’ll add others when dates are confirmed. 2009 recruit Max Nicastro, who will head to Red Wing camp next week, got himself in a bit of hot water this week due to media inexperience. After telling Detroit media that "it was an honor" to be picked by the Wings and that he patterns his game after Niklas Lidstrom, Nicastro was quoted in his hometown newspaper saying that his "heart sank" when Detroit selected him, because he thought Nashville would draft him. The Detroit Free Press and some Red Wing bloggers were all over the comment, but, like the flubs of the presidential candidates, this will pass. Trivino, whose father was a semi-professional soccer player in Argentina, had to choose between "football" and hockey as a 14 year old. Incoming goalie Rollheiser told BCSportsBeat.ca about his excitement over being drafted by a Canadian NHL club. At the last week's USA Select 16 Festival, Thayer winger Charlie Coyle tied for most goals with five in five games. Goal-scoring might be in his genes as his cousin is former Terrier standout Tony Amonte, who finished his NHL career with 900 points, 11th best among Americans. Gone camping update: Look who we found!